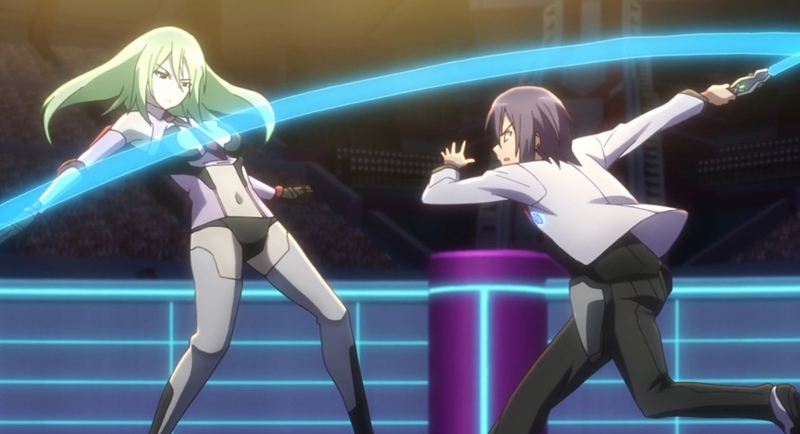 In The Asterisk War episode 20, The Phoenix Showdown, Julis Riessfeld and Amagiri Ayato face off against the artificial life forms RM-C and AR-D in the final round of the Phoenix Festa. Sasamiya Saya and Toudou Kirin, despite their injuries, launch an effort to rescue Flora Klemm. Can Ayato and Julis stand against the two rapidly evolving artificial life forms without Ser-Veresta? Will the assassin who doesn’t value his own life kill Flora before Saya and Kirin can extract her? In spite of being artificial life forms, AR-D learns and adapts — more quickly than even Ayato or Julis! Capture from the Crunchyroll stream. Ayato and Julis bring another one of their solid, well-thought-out strategies into the match with AR-D and RM-C. They fight hard, but as we all saw coming in the last episode, the two artificial life forms from Arlequint Academy decide to use the move they used against Saya and Kirin: RM-C shed herself of her Luxes and gave them to AR-D. Without Ser-Veresta, how long can Ayato last, even with Julis’ support? Saya and Kirin enter the abandoned hotel where Flora’s being held. Saya pulls the door open, and Kirin uses her blade as a mirror to examine the room. Seeing Flora seemingly alone, Kirin rushes in, only to be forced to counter a vicious attack from the shadows. Taking advantage of Kirin’s injured leg, the kidnapper knocks her back, puts a blade to Flora’s throat, and demands Kirin drop her sword. Can Saya’s guns turn the tide? Or will the kidnapper’s shadow blades murder Flora? Episode 20 starts by replaying the last minute of episode 19: AR-D gushes about how much he’s looking forward to the match, and Ayato says that while he can’t guarantee excitement, he and Julis intend to win. RM-C keeps up their old shtick by pointing her gun at AR-D’s head and telling him to shut up and fight. While they were thus distracted, Julis and Ayato reflect that they won’t have to hold back against these two. Julis draws her sword and, as Ayato reaches for his, the crowd holds its collective breath. Which sword will he draw? They are disappointed when he doesn’t draw Ser-Veresta. Ayato and Julis press their attack against AR-D — just before RM-C intervenes. Capture from the Crunchyroll stream. The two from Seidoukan Academy attack, hitting AR-D with moves they knew he’d recognize while not forgetting about RM-C. As usual, Julis and Ayato had carefully plotted their strategy before the match started. 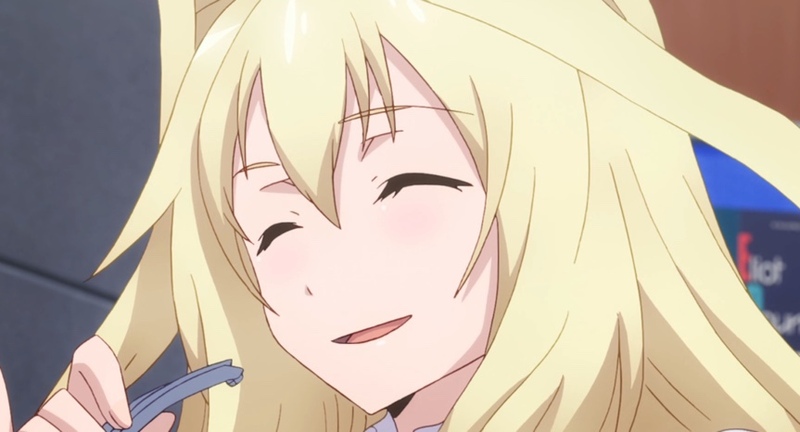 They land several hits on AR-D, especially Julis’ flame attacks. Ayato is even able to hack off one of RM-C’s arms, forcing AR-D to project his force field to protect her — and leaving himself open to one of Julis’ trap attacks. Unfortunately, AR-D’s armor protects him from even the trap’s intense heat. 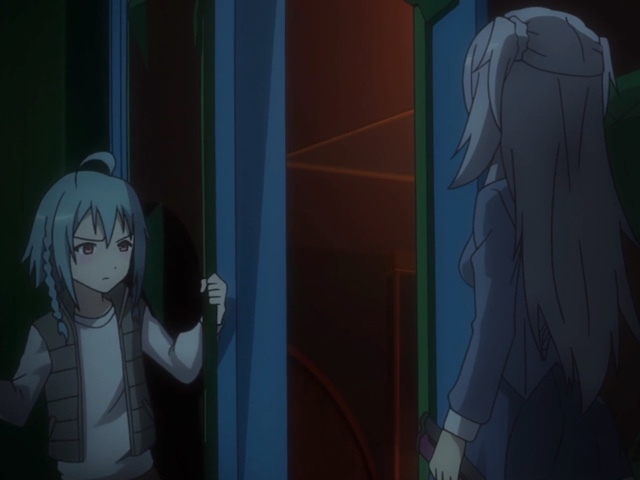 Julis and Ayato back off to regroup while RM-C analyzes her opponent’s strategy. AR-D is shocked when RM-C tells him that the attack on her had been intended to immobilize him. He’s delighted at the complexity of Ayato and Julis’ attack. This time, when AR-D praises Ayato, he also praises Julis. He’s apparently having the time of his life. AR-D concludes that his two opponents are still far beyond him in terms of tactics, so he asks RM-C to make their move: drop her Lux attachments so he can join them to his body. RM-C agrees. Before they begin their merger, RM-C fires a defensive weapon designed to cover them while they change. It’s effective, though Ayato rushes toward them in an apparent attempt to stop the fusion. RM-C gloats that he’s too late, but the fusion wasn’t his target. He slices RM-C’s badge in half, eliminating her from the competition. AR-D announces that it’s now time to get Round 2 underway. Unable to stop the fusion, Ayato’s nevertheless able to claim a small victory: slicing RM-C’s badge in half. Capture from the Crunchyroll stream. Saya and Kirin reach the lower level of the abandoned hotel, where they expect to find Flora. When the area looks clear, Kirin enters slowly. She sees Flora, who tries to warn the sword-master to stay away. Their enemy attacks as Kirin tried to untie Flora. Kirin’s speedy reflexes saved her and she jumps away, only to collapse to one knee as her injury acts up. Realizing that the shadowy, column-filled hall gave their opponent a huge advantage, Kirin is nevertheless able to deflect his attacks. Unfortunately, he adjusts his tactics and put blades at Flora’s throat. He orders Kirin to drop her sword or watch Flora bleed to death. Saya, until now hidden in the doorway, blasts the kidnappers position, forcing him to retreat. Then she fires a flare that, at least for a few moments, washes away the shadows. Kirin unties Flora and half-carries her towards the exit. The flare dies and the kidnapper strikes, injuring Kirin’s ankle. Saya fires again to drive him back, and Flora’s able to make it to the door. Injured but undaunted, Kirin faces the kidnapper, only to feel his blade lance out of a shadow to strike her left side. The wound bleeds profusely. She doesn’t surrender. She uses her art of sword-drawing “Folded Wing” to project an image of his defeat into his mind before launching her real attack. She injures him seriously before falling to the ground, weak from the loss of blood. He pauses to admire her technique. Saya uses the opportunity to blow him through the wall. Kirin uses her speed and skill to confront the kidnapper. Capture from the Crunchyroll stream. Before she looses consciousness, Kirin wonders how Julis and Ayato are doing. Turns out they aren’t doing well. AR-D, in addition to having more power after fusing with RM-C’s Luxes, has evolved his fighting style. He’s begun to use his defensive shields to hold Ayato in place while he attacks with his huge war-hammer. Ayato barely escapes the trap. Momentarily overwhelmed at his sense of power, AR-D marvels at the capabilities his creators — Ernesta Kühne and Camilla Pareto — gave him. That prompts Ayato to ask Julis a what-if question: what if AR-D is now like Ayato after learning how to break free of his sister’s limiter? They can’t pursue the line of thought; AR-D renews his attack. They dodge the powerful assaults, one after another. Finally, AR-D launches a new kind of attack. He projects his forcefield into the shape of a corral, trapping Julis and Ayato. They can’t evade his attack now. Julis’ power holds the next hammer-blow back, but she’s winded. The next strike will likely be devastating. AR-D attacks. Ayato slices the hammer-head in half. Then he slices through the corral. Ayato announces that their counter attack begins now. AR-D “remembered” the moves that Ayato used to rescue Julis from Silas Norman back in episode 4. Apparently, Ernesta Kühne had access to those recordings. I like seeing a show keep its plot woven together. Once again this show impressed me with its portrayal of how Julis and Ayato plan their fights. There’s real analysis work that goes into their preparation; they leverage their creativity, too. It’s nice to see planning and preparation effort pay off, especially given how often other shows portray contests as exercises in spontaneity — which doesn’t work often in the real world against real foes. Saya and Kirin showed some real operational skills as they entered the hall. Capture from the Crunchyroll stream. When they reach the hotel’s lower floor, Saya opens the door. Instead of sticking her head in to look around, Kirin uses the polished metal of her sword as a mirror to look around — while she stayed safe and out of sight. Cool detail! Kirin realized that her foe had the ability to “weaponize” shadows. That kind of power would be tough to defend against! When the kidnapper says that Kirin’s Folded Wing was great but not great enough, Saya responded, “No, no. That’s good enough,” just before she blasted him through the wall. Unless his techniques saved him, anyway. Saya’s sense of humor appears to remain intact even under combat conditions. 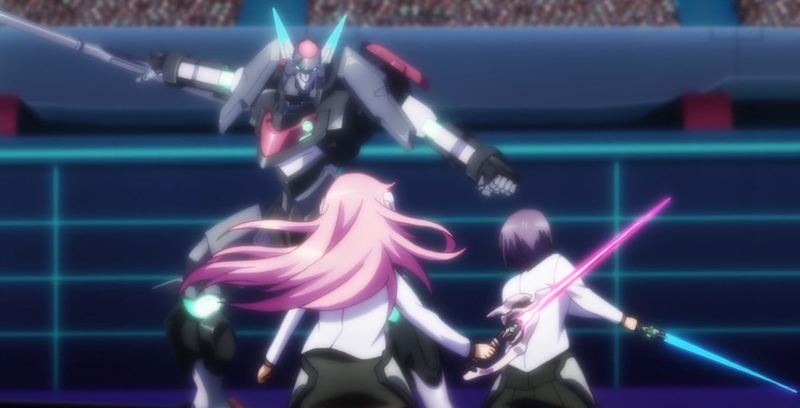 It was nice to see both Julis and Ayato take turns protecting the other during AR-D attacks. I think this show’s done a great job of showing that Julis can hold her own, just like Saya and Kirin can. Nothing against Ayato — I’m pretty sure he’s going to break the animation again (like he did in episode 12) to defeat AR-D in the next episode (unless some major shocker happens!). But I really prefer to see a team fighting instead of a single lone, powerful character. I think that motif’s been done to death, and I rarely see it play out in real life. Heck, the real fight isn’t even on the battlefield anymore. It’s in the preparation, the work to build a team, that battles are won or lost. When AR-D unleashed one of his strikes — just after Julis and Ayato had complained that his power levels appeared unrealistically high — the hammer-head left an impact crater. Julis calmly looked over and observed that AR-D’s power level had gone up, too. No panic, no despair — just an annoyed acknowledgement of fact. I could tell she’s a veteran! Claudia, in her sweetest, most world-domineering voice, tells Julis and Ayato to “Have at it!” Capture from the Crunchyroll stream. Claudia just walked into the announcer’s booth and commandeered the microphone. Just like that. Easiest thing in the world! She certainly has guts — and the poise to do whatever she needs. Poor AR-D, observing the announcement and its aftermath, says, “I have no idea what that was all about. But all I can do is exert my power to the fullest!” I really like AR-D. I think that RM-C treats him unfairly, but he’s strong enough not to let it bother him too much. He’s shown that his interest is in growing better than he was yesterday. He wants to challenge himself against the strongest opponents. In the final analysis, isn’t that a decent way to live? Gotta love Dirk’s simple response when he saw Ser-Veresta in action: “Crap.” He knew that his plans were kaput. I’ll be interested to see if he maintains such a calm demeanor in future episodes. Another episode where nothing kicked me in the teeth! Say what you want about the show, but I think we can agree that it’s consistent! It occurs to me that this show is all about trust. Julis and Ayato put themselves in harm’s way, confident in their own skills and confident in their partner’s. 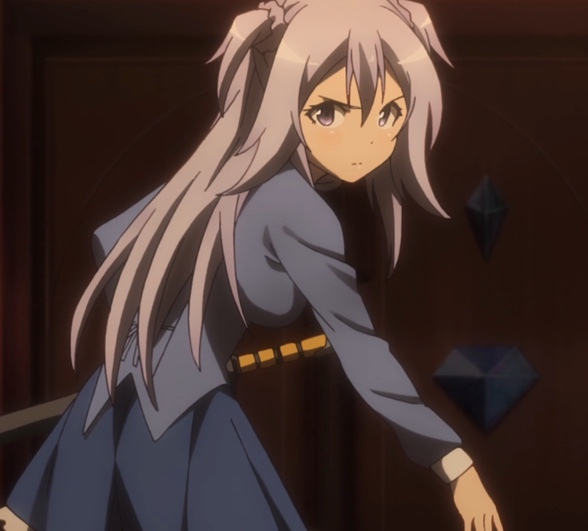 Kirin rushes into the darkened hallway to save Flora, confident that Saya has her back. 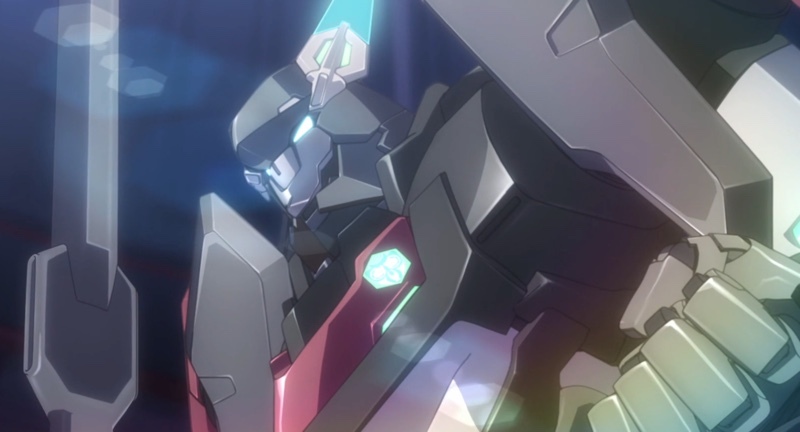 In addition to the little character moments, the trust motif is something I find really, really attractive about The Asterisk War. It’s certainly all too rare out here in real life! Kabaneri of the Iron Fortress Episode 6: Head for the Light!